Amethistle: Creativity for the Fun of It! : Mom, Where Are My Pants? Mom, Where Are My Pants? My younger daughter has had just about enough of my "Reduce, Reuse, Recycle" obsession. I've mentioned before that I save every pair of jeans my family outgrows or wears out, but it's more than just jeans. Recently I took apart an abandoned pink "Disney Princesses" backpack to salvage the straps, zippers, and what hardware I could. "Mom, I liked that backpack!" "You haven't used it in over a year. Trust me, honey, you didn't want to see what was growing in those pockets!" My other daughter had one of those all-in-one binder cases. It zips around the edge, has pockets to hold folders and pencils, has a three-ring binder, and has a shoulder strap with clips at each end. She abandoned it when the zipper broke and spilled all her stuff out. It's big, and I figured it had to be good for something, so I put it aside and hung onto it (and I wonder why it's hard to walk around in my house!). So the other day I took my seam ripper and a hammer and went to it. I was amazed at how much work had gone into making it--some parts of it had 5 or 6 seams layered on top of each other! It was constructed in modules: the folder pocket, the pencil pocket, the backing module, the strap module, and so on, ending with the edging tape. Each one was pretty much self-contained and then layered onto the whole. I ended up tossing most of it after my reverse-engineering session, but the strap and related hardware are useful. An old kids' winter jacket provides zippers, pull cords and those little barrel-shaped cord locks, among other things. With all my collected junk at hand, it was time to put my plan into action. I have recently started taking yoga. I like it, but the mat is kind of unwieldy, so I need a bag to carry it in. I looked on the Web and found lots of them, but they ran $20-$85! More than I want to spent on a glorified tote bag. I also found a couple of sewing patterns. The free yoga bag pattern by Amy Butler seems to be popular. 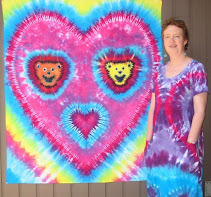 Nothing was quite what I wanted (nothing was tie-dyed! ), but I got a few ideas. I used a couple pairs of my kids' old jeans, one sized 4T (not tie-dyed) and one size 6X (faded and previously tie-dyed). I cut the legs off the 4T, then separated the top front from the top back--I want to use the elastic waistband in the back, and I love the look of those little jeans pockets. I ripped open the inseam of the 6X pants, then sewed the legs together down the front and back to make a big tube. I made the seam allowance bigger at the crotch to lessen the shaping at the crotch (that is, I cut off part of that extra bit that goes between the legs). I didn't make it completely flat, so it's a little roomier in the seat. In the following picture you can see the new seam holding the legs together. I top-stitched the new seam to lie flatter. On the front of the tube, I top-stitched on the rear end of the 4T jeans as a big pocket. Since I didn't undo the side seams of the 6X pants, I had to wrestle with getting the fabric through my sewing machine without sewing through more layers than I wanted. But I managed. With the elastic waistband, this is a great pocket for a water bottle. I just love the cute little ribbon-and-bead pocket embellishment! My daughter loved these jeans, and she howled when she saw I'd used them--never mind that they had holes in the knees and were three sizes too small! Next came the second pocket, made from the front of the 4T jeans. Here I used a zipper (with that cute pompom zipper pull) that I scavenged from the pink backpack previously. First I sewed one side of the zipper to the waistband, then I sewed the other side of the (zipped) zipper to the big 6X tube with the pocket wrong side out like a big flap. Finally I sewed the pocket down onto the tube and top-stitched it. Last, I sewed the bottom of the tube shut, matching the existing hem seaming as best I could. I included the heavy-duty plastic D-rings on their straps that I had salvaged from the binder case. I left the snap and zipper of the 6X pants usable because it makes it easier to get the yoga mat in and out. I had sewed up the snap and zipper for the pants that became the second pocket. I added an elastic drawstring and cord lock (from the winter jacket) through the top belt loops, and voila! I'm ready to go to yoga class anytime. Oh yes. My daughter's 4T pants have a happy ending after all. Besides that ribbon-and-bead embellishment on the back pocket, they had an applique on one leg front of a star and a heart with more ribbons. I cut that out, cut out another heart from the same jeans leg, and ironed them on as knee patches with fusible webbing. I finished the edges with fabric paint. So the dark blue jeans get a little more life thanks to patches over the holey knees, and my daughter gets to enjoy her embellishments a little longer. I just love a happy ending; don't you?